What distinguishes those who hope from those who merely indulge in wishful thinking is their willingness to confront and challenge the apparent hopelessness of the situation in which they find themselves. Therein lies the paradox of hope. The situation in which we—located in the first quarter of the twenty-first century—find ourselves in is one of increasing instability and insecurity. We are living in a divided and divisive world in which the need for global interconnectivity clashes with a renewed emphasis on cultural and national boundary maintenance. Hope requires us to acknowledge—in our own lives and the lives of others—the consequences of this contradiction, and to find within it the necessary resources to seek to resolve it. Some at least of these resources lie in the public institutions of civil society: institutions that—by their very existence—acknowledge the importance of civil association and the recognition of equal worth. As one such institution, the university has two invaluable resources of hope to bring to our divided world: its passion for truth and its insistence on the necessity of reasoning together. 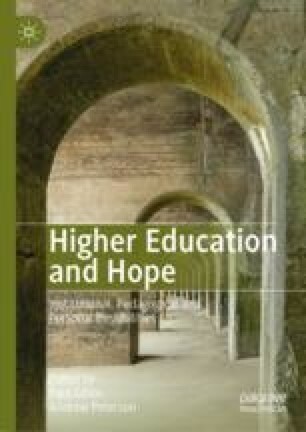 By providing a space in which these resources can be developed and used for the common good, universities provide—in the face of a deeply divided world—hope of a common world: not an ideal world, but a better world in which the cravings of competition and the striving for cooperation and collaboration find a kinder balance. But, of course, this, too, is an expression of hope—hope that the liberal university, bedevilled as it is by privatisation, marketization and managerialism, can live up to its historic mission. Throughout this chapter, I refer to each cited author by her or his full name on first citation and thereafter by the surname alone. The only exception to this self-imposed rule is in the case of authors who share the same surname and where confusions could therefore arise as to which particular author is being cited.